You may have missed the news that this past Monday in Detroit was one for the record books: The city was hit by an unprecedented deluge of rainfall -- 4.57 inches, coming just behind the all-time record set back in 1925 -- resulting in catastrophic flash flooding that swamped basements, destroyed cars and killed at least one person. But you definitely didn't miss the soggy weather if you're living in Raleigh, Washington and Baltimore, or Long Island and New Jersey, all of which got their share of unusually heavy rainfall (and if you're in New England, you're next). 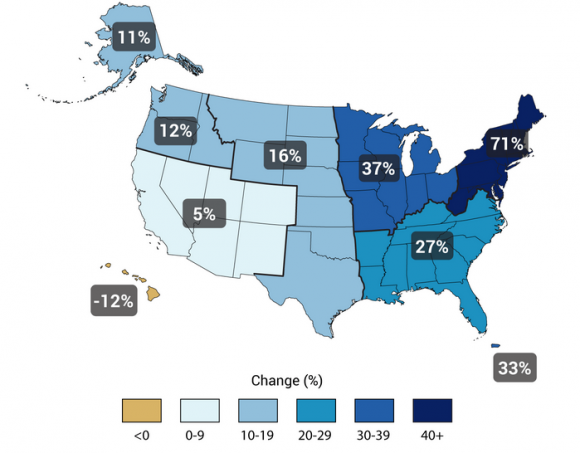 Since the late 1950s, the heaviest rainfall events have become more common and more intense in much of the U.S., with the highest increase — 71% — occurring in the Mid-Atlantic and Northeast. Scientists have attributed this in part to manmade global warming, since the atmosphere can hold more moisture at higher temperatures, and more evaporation is also taking place. This means that storms, from localized thunderstorms to massive hurricanes, have more energy to work with, and are able to wring out greater amounts of rain or snow in heavy bursts. 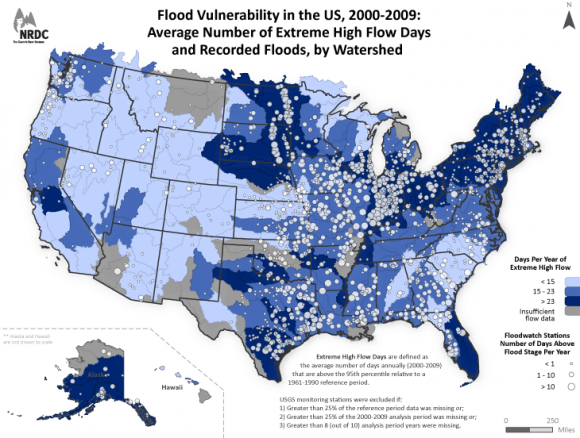 In general, more precipitation is now coming in shorter, heavier bursts compared to a few decades ago, and this is putting strain on urban infrastructure such as sewer systems that are unable to handle such sudden influxes of water. Preparing for the effects of climate change can mean preparing for an entire summer's worth of rain to fall in one morning, as occurred Wednesday morning in Islip. It will mean updating sewage systems so that they're prepared for once-in-a-century storms that are starting to occur a whole lot more frequently than that. The alternative, as we're already seeing, will be property destruction, death and injury, drinking water contamination and the spread of water-borne pathogens and horrors like the so-called Chicago climate change maggots. In Detroit, the cost of updating the sewers will be astronomical; and even the billions of dollars' worth of upgrades needed, some worry, won't be enough. As a spokesman for Michigan's Oakland County Water Resources Commissioner told the Detroit News, “There’s no storm drain big enough to handle 4 inches of rain in four hours." Federal and local officials "can ignore it and we can hobble along with Band-Aids, rubber bands and glue," he added, "but if we wish to prepare and not have to go through drama of flooded streets, electrical outages and crumbling bridges, then we need to get smarter about the future."